CAN I SAY - I LOVE THIS??? 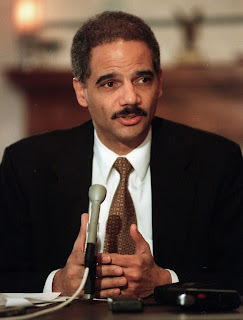 WASHINGTON (AFP) – US president-elect Barack Obama has named longtime lawyer Eric Holder to be attorney general, making him the first African-American ever in the post, US media reported Tuesday. Holder, who served as deputy attorney general under former president Bill Clinton, will head the Justice Department, Newsweek magazine said, citing legal sources close to the presidential transition. Obama's transition team did not immediately comment on the report. "Obama offered Holder the job and he accepted," the magazine said on its website, adding that "the announcement is not likely until after Obama announces his choices to lead the Treasury and State departments." he still has to go through the proccess but so far I like the selection.